Outside of actual pastel artists, the word “pastel” to most of us brings to mind sidewalk chalk from elementary school or gummy oil pastels from middle school art class. But there are soft pastels that are a grown up, real fine art medium– favored by famed artists as Edgar Degas, James Abbott McNeill Whistler and Mary Cassatt. What do you need to get started in pastel? 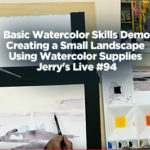 Join us to learn the bare bones basics about this medium, along with some basic beginner techniques to get you started with this entrancing, beautiful medium that functions both as drawing and painting, simultaneously!